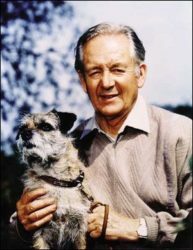 Welcome to a page about one of the greatest writers of our time, James Herriot. Herriot being his pen name, James Alfred Wight began writing about his experiences as a country veterinarian in England. His stories have touched millions of people. Be sure to check out everything that is at this site, including his books, his life and times and much much more. Also, be sure to leave comments!